As one of the earliest settled areas of the United States, the Delmarva Peninsula – including Talbot County and the town of Easton – has a long and proud history of self-sustainment. The rich farmland and extensive waterways have sustained our economy and provided a way of life for generations of Eastern Shore residents. In addition, modern consumers are showing an increasing demand for more locally grown, farm to table food goods. The mission of the Easton Farmers Market is to provide a marketplace for farmers and vendors to sustain their local operations, while at the same time offering consumers a venue that fills their whole plate with local produce. 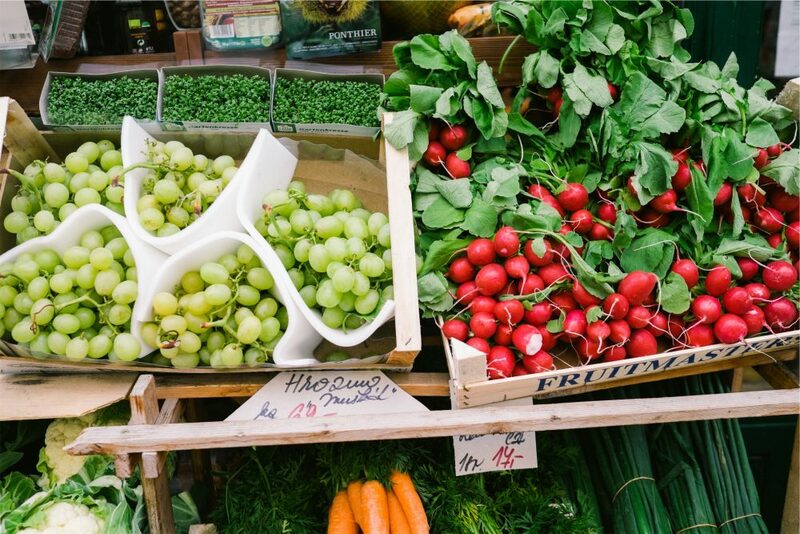 From local produce growers to watermen and seafood distributors, from bakers to ranchers and local artisans, the Easton Farmers Market provides an entire meal and home decor in a friendly and festive environment. Live music by regional and national acts can be enjoyed from 10:30am – 12:30pm and lends a festive quality to the open air market. If you are a musician and would like to perform during the Farmers Market, please email Kimberly. Check which vendors will be present at each Market with our Interactive Map. Click on a numbered stall to see which vendor is there and the products they sell. Looking for a specific item? Use our Product Search tool to see who has what you need. If you are interested in being a vendor with the Easton Farmers Market, please follow this link for an online application or go directly to Manage My Market. Click ‘Register Now’ and create a profile for yourself. Fill out all the information listed in three simple steps. The third step will ask you to apply to a market. Choose “Avalon Foundation Easton Farmers Market 2017”. From your Manage My Market account you can check the status of your application and manage your schedule. A $15 application fee will be applied to all accepted vendors. This fee will be collected with your vendor dues on your first day at the Market. Easton Farmers Market is proud to support local non-profit organizations. Every Saturday, a non-profit can be found at the Washington Street parking lot entrance. Please stop by and engage the featured non-profit, volunteer or donate. Easton Farmers Market is open every Saturday 8am-1pm, April through December and is located on North Harrison Street in the parking lot directly behind Goodwill. The market is the work of The Avalon Foundation, a non-profit whose mission is to provide diversified arts, educational and community programs that improve the quality of life on the mid-shore.